Stunning Lara Croft has something special for you: plenty of Free Spins, Super Mode bonus games and of course, impressive multipliers. 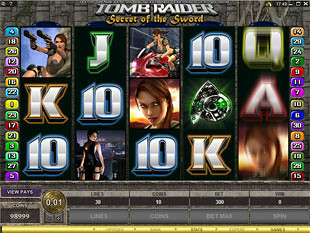 Play Tomb Raider Secret of the Sword slot machine released by Microgaming and find your own treasure hidden somewhere deep in jungles under perfect blue sky. Play this 5 reel 30 paylines slot in no download format as well with free spins no deposit Microgaming bonus. To enjoy the beauty of main heroine as well as to fight to death for the best prizes you don’t need to install casino software on your computer. Lara shooting, Lara seducing, Lara jumping or Lara racing red bike… There are plenty of opportunities to feel the atmosphere of real adventure with hazardous racing and great wins. The Portrait of Lara Croft with her shrewd eyes staring deep into your soul is the wild symbol. It can substitute for other symbols except Passport and Excalibur Key to present you more winning combinations. Excalibur Key is the scatter symbol. Get two or more scatters on the reels to multiply your total bet up to 100 times. Such maximum award can be got if you collect 5 scatters on the reels. Play with the maximum total bet of $60 to win $6,000. There are several coin sizes to choose from. You can start with penny and cover all 30 paylines spending just $0.30. You also can choose among such coin sizes as $0.02, $0.05, $0.1, $0.20. The maximum possible bet is $60. You can play with up to 300 coins per spin that means you will be playing with 10 coins per line. 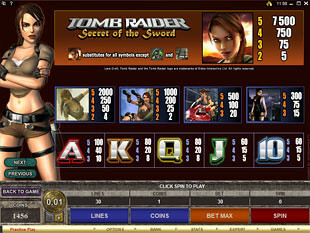 Thus, you can get the top jackpot of 7,500 coins or $15,000 for 5 Lara Croft Portraits. Just play with $0.20 to get the best. Getting three or more scatters – Excalibur Keys – you activate 10 Free Spins. Enjoy Rolling Reels feature. When you get a winning combination and collect your prizes, the winning symbols dissolve and are replaced with other symbols that also can bring you some prizes. Thus, it is like extra free spin awarded. When you get consecutive wins you also are awarded with up to 5x multiplier. However, if there are no consecutive wins, the multiplier reset. Free Spins cannot be retriggered. The other bonus feature – Global Adventure Bonus – can be activated when Passport symbols appear on all 5 reels. To activate all reels you need to get Passport on the center of the reel. Such reels are held till you activate all 5 of them. So, your aim is achieved and you collect Passports to activate this feature. 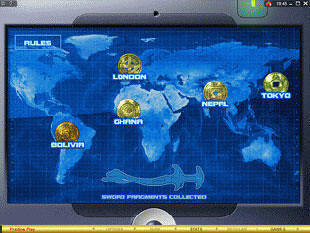 Now you should choose Bolivia, Ghana, Nepal, London or Tokyo to look for fragments of the precious sword. Depending on your choice the feature can be ended or you can be awarded with Hidden Treasure Bonus. 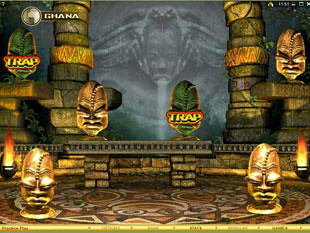 Then you need to choose again to reveal 2x multipliers, Shootout Bonus or Win All symbols. Shootout Bonus is a great opportunity to check your shooting skills. 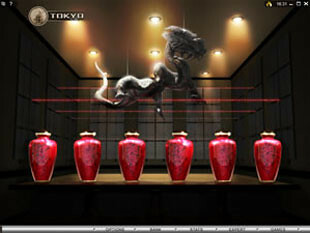 Choose among several disks displayed and shoot them to find out your award. It is all about luck and your sixth sense to choose the best disk with best prizes. 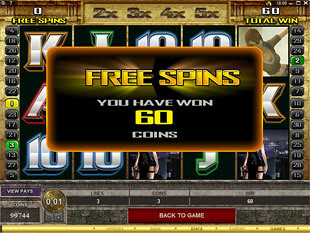 However, the lucky person will activate Super Mode with 5 Free Spins with multiple wild positions. This feature is triggered at random once. So, don’t waste your opportunity to win the best.